Have some leftover rice? Turn it into a sumptuous Egg Biriyani – an easy one-pot meal made with fried hardboiled eggs, and Egg Roast Masala. Oh, it was one of those days when the pantry was empty and the icing on the cake was that I was in no mood to cook as well. I wanted to prepare something real quick and decided to raid the refrigerator. There it was – some leftover rice and few eggs! My mind worked frantically and I resolved to prepare Kerala Egg Roast and have with the rice and curd. A quick and easy to prepare recipe, the Egg Roast is my savior on days when I don’t have any side dish for Rotis. It had been our goto side since childhood and this is the first recipe which I learnt to cook. All thanks to Dad! And thus, I prepared the Egg Roast and while I thought of having it as a side, I thought why not transform it into a biriyani? I took the leftover rice, heated it a splash of water and condiments, and layered it over the egg roast along with some fried onions, dried fruits and a handful of pomegranate seeds. I then finely diced an onion, tomato and green chilies to mix with curd for a raita. Voila! Lunch is ready! I am sure this biriyani will make you realize that preparing one isn’t such a tedious job. This is a quick fix recipe and may not be the traditional method. While I love making a pressure cooker biriyani which is the easiest way, I could never succeed in making the one with eggs. Oh, that reminds me! I tried the pressure cooker method by throwing in some spices, making a gravy and adding rice to the cooker – while at P’s home. It was a disaster! I know that. And I’m sure P’s parents knew it too. But then they reassured me that the quality of rice wasn’t good and hence it wasn’t tasting the best. Ah! They are really sweet that way! 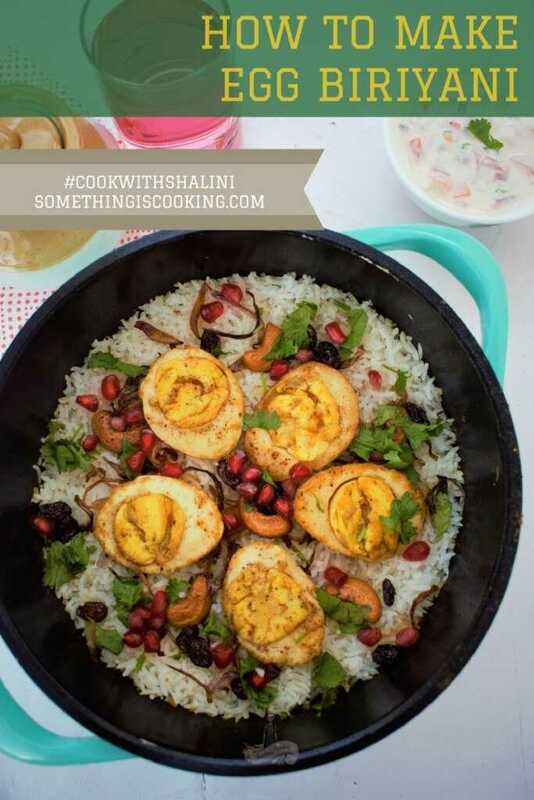 Make Delicious Egg Biriyani at Home! Let’s talk Egg Biriyani now. If you don’t have leftover rice, fret not! Cook rice along with spices like cardamom, cinnamon, cloves and bay leaf until half done. Don’t forget to add a little salt and oil too so that the grains don’t stick to each other. Remove to a bowl, fluff it gently with a fork and let it cool down completely. Hard-boil the eggs. In a pan, heat a tablespoon of ghee and fry the dried fruits, and onion. Add a pinch of chili powder to the ghee. Slice the hardboiled eggs in half and add it to the hot ghee. Roast them until golden brown. Prepare the Egg Roast. Layer it with cooked rice, fried eggs, fried onion, coriander leaves, mint leaves, fried dried fruits, and pomegranate seeds. Serve hot with raita, pickle, and pappad. Heat the leftover rice in 1 /4 cup of water, cardamom, cinnamon, cloves and bay leaf. Remove to a bowl, fluff it gently with a fork and let it cool down completely. If you don't have leftover rice, cook rice along with the spices until half done. Add a little salt and oil too so that the grains don't stick to each other. Remove to a bowl, fluff it gently with a fork. In a pan, heat a tablespoon of ghee and roast the dried fruits, and onion. To the same ghee, add a pinch of chili powder. Slice the hard-boiled eggs in half and roast until golden brown. Remove and keep aside. Prepare the Egg Roast by following the recipe mentioned here. 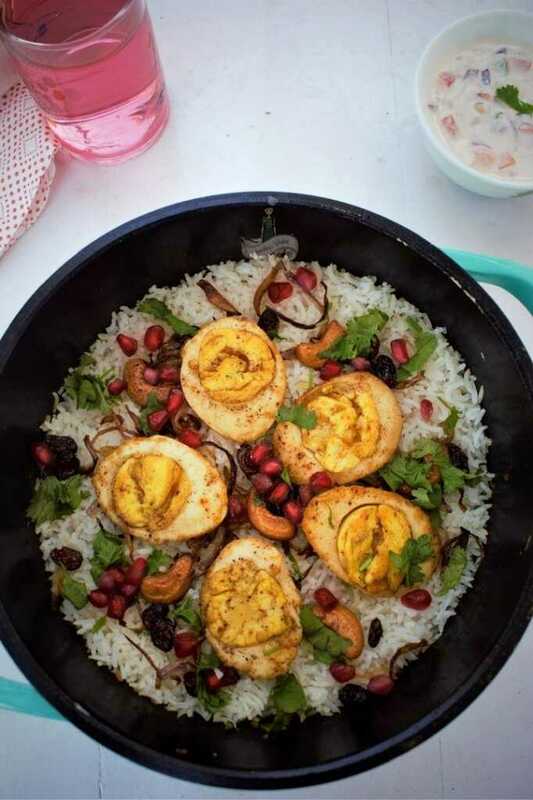 Layer it with cooked rice, fried eggs, fried onion, coriander leaves, mint leaves, fried dried fruits, and pomegranate seeds. Cover with a lid and simmer for about five minutes. Serve hot with raita, pickle, and pappad. Egg Roast is an excellent side for rotis, appams and idiyappams. Christmas is here! Why not try this easy recipe for Christmas lunch? Let me know how it turns out. Meanwhile, you can pin this image for later use! 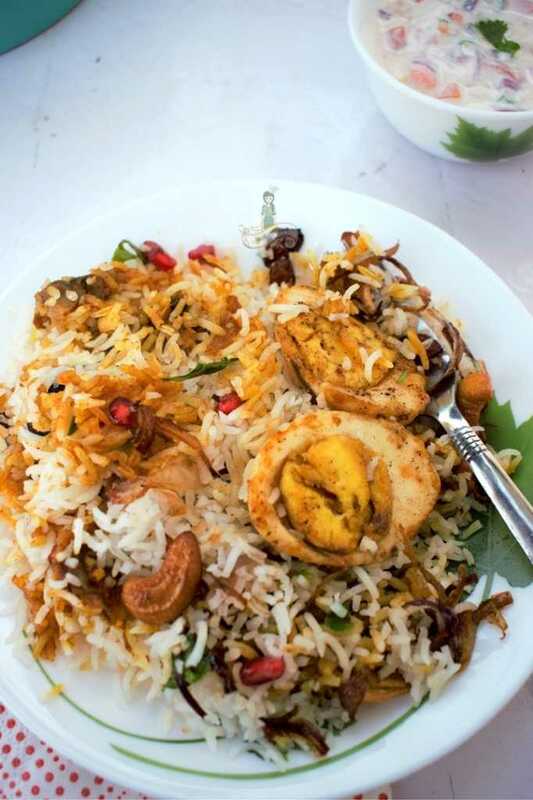 I have made traditional egg biryani – the tedious way. This sounds simple and quick, something that I can make on a work day as well. 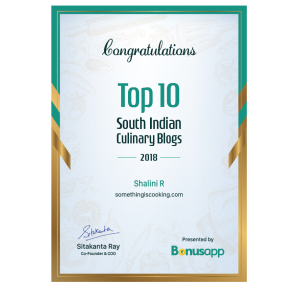 Thanks for sharing, Shalini. This looks so awesome, that I’m salivating now. Wow Shalzz this looks so so so yummy! I am a die hard fan of eggs; just unable to have them due to an allergy issue!! Dang I want this!!!!!! This looks like such a wholesome, filling and sumptuous meal Shalini! The method is easy to follow and best part is the ingredients! All easily available at any point! Love the beautiful garnishing, looks super yummy! Sharing this with my daughter, she can use such quick-fix and delicious recipes! Now this is one dish I’ve never tried and thanks so much for sharing it Shalini. 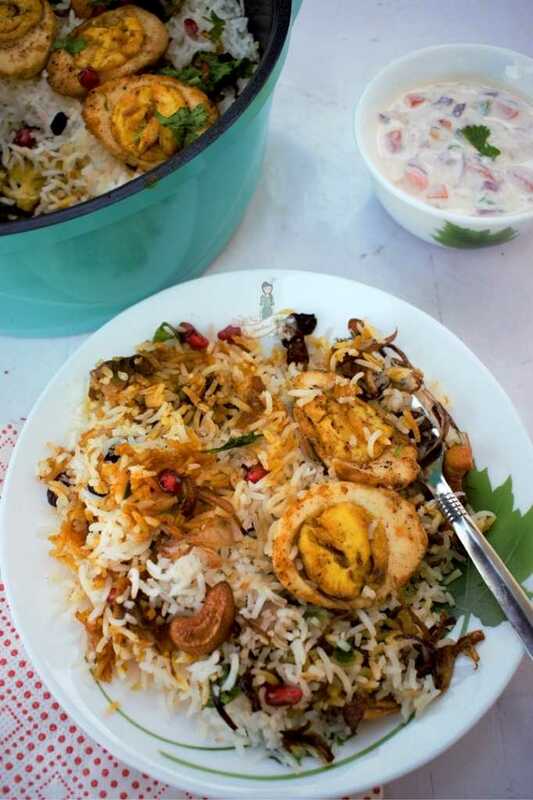 Thanks also for the tip on how to get loose fluffy rice in the biryani….. this was a double bonanza of a post -egg roast and biryani ! Merry Christmas to you …. perhaps I will make this for lunch .